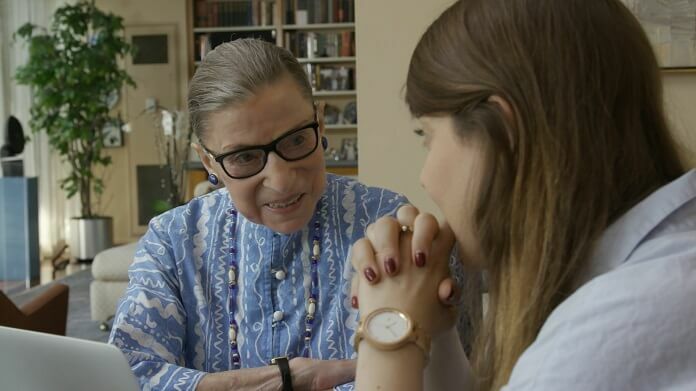 Ruth Bader Ginsburg is a fierce fighter for justice and the timely documentary RBG from directors Julie Cohen and Betsy West does a terrific job of touching on key moments in the career of the indomitable Supreme Court Justice. Ruth Bader Ginsburg permitted the directors access to private moments with her friends and family, and the result is a documentary that not only extols her ground-breaking legal career but also provides insight into what makes her tick. At 85, Ginsburg’s one of the most admired Supreme Court Justices in history. She’s also become a pop culture phenomenon, and her decades of defending women’s rights in a male dominated system have, rightfully, made her a hero to women of all ages. Ginsburg admits to wanting to do everything the boys did while she was growing up, and RBG explores her life-long fight for gender equality. A documentary series would be necessary to fully comprehend the impact Ruth Bader Ginsburg has had in the battle for women’s rights. However, RBG does touch on pivotal moments in her career over its swift 96-minute running time. Included in the documentary are brief summaries of a few of Ginsburg’s cases including those of a female Air Force pilot denied a housing allowance and a man who was denied his wife’s Social Security benefits after she died in childbirth. RBG offers a fascinating look at the era in which Ginsburg attended Harvard Law School and then Columbia Law School. Upon graduating, not even the endorsement of a male classmate helped open any doors. At that time, law firms did not want to hire women. Directors Cohen and West also provide a glimpse into Justice Ginsburg’s personality and sense of humor, with Justice Ginsburg even chuckling as she watched Kate McKinnon’s impression of her on Saturday Night Live for the very first time. RBG reveals Justice Ginsburg not only takes the Notorious RBG nickname in stride, but also believes she has a few things in common with rapper The Notorious B.I.G. (Christopher Wallace). Additional footage shows Justice Ginsburg in her time away from the court appearing briefly in a Washington National Opera production (reciting lines she wrote) and working out while wearing a “Super Diva” T-shirt. Justice Ginsburg’s a superhero and role model, a national treasure whose impact on America’s legal system cannot be overstated. This surprisingly moving documentary on Justice Ginsburg’s personal and public life is both enlightening and entertaining. RBG does a terrific job of spotlighting her accomplishments while also pulling back the curtain and allowing us a brief look at what drove her to devote her life to fighting for others and at the support system that keeps her going.